CITY OF INDUSTRY, CA -- (Marketwire) -- 07/29/09 -- Newegg.com Inc., the second-largest online-only retailer in the United States, and the National Federation of the Blind (NFB), the nation's leading advocate for Internet access by blind Americans, today jointly announced that the NFB has awarded its Gold Level NFB-NVA Certification to Newegg.com, the first-ever online retailer to be so honored. The NFB's Gold Level Certification is awarded in recognition of commitment and innovation to help ensure equal web access to the visually impaired individuals. Dr. Marc Maurer, president of the National Federation of the Blind, said: "The National Federation of the Blind is pleased that Newegg.com, one of the largest online retailers in the U.S., is setting an example for the industry by providing an unprecedented level of access to its Web site for blind shoppers. We are pleased to award Newegg.com our gold level Nonvisual Accessibility Web Certification, which has never before been achieved by an online retailer. 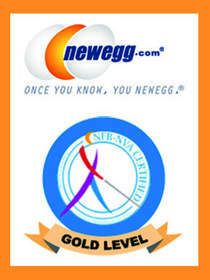 It is also notable that Newegg.com achieved this high level of certification in only six months." Newegg.com has launched a variety of improvements and enhancements for the visually impaired, including the implementation of special software programs that allow users with sight issues to navigate the site quickly and easily. Changes include an advanced Screen Access program and a specially designed magnification program that allows users to choose multiple settings to adjust size, font color and other visual attributes that can improve the online shopping experience for the visually impaired. Newegg's Vice President of Marketing and Merchandising Bernard Luthi noted: "Newegg.com is fiercely committed to making our customer experience the very best it can possibly be for all our users -- and that includes the more than 11.3 million Americans who live with vision-related disabilities. We are extremely grateful for the assistance afforded us by the NFB and Deque in helping improve our site for visually impaired users, and we look forward to making ongoing improvements as new technologies and features become available to us." The NFB's Nonvisual Accessibility Web Certification Program (NFB-NVA) is conducted in partnership with Deque, http://www.deque.com/, a software company dedicated to ending web discrimination and improving equal Internet access for all people, regardless of disability. The program brings Internet companies and developers together with leading experts in the field of web accessibility for the blind to ensure equal access, including equal transaction speeds, for the visually impaired. Applicants for Gold Certification undergo a stringent evaluation and testing process for their sites. During the six-month evaluation process of Newegg.com, NFB and Deque experts worked closely with Newegg.com site developers to make improvements in the design and functionality of the site's many features geared toward helping visually impaired users. As part of the evaluation process, the NFB conducted manual testing that included blind and low vision users utilizing the site for a "real-life" experience and completing purchase transactions at the same speed as a sighted person. Only Internet companies that have addressed a significant portion of all accessibility issues are granted the right to display the NFB-NVA seal of approval on their sites. In addition, the NFB continues to monitor all its certified sites and renews certification on an annual basis. Preety Kumar, CEO Deque Systems, Inc. said, "We are delighted to have had the opportunity to work with the NFB and Newegg.com on achieving the highest level of accessibility by any online retailer. We look forward to continued collaboration as we strive to maintain this level of excellence." Newegg.com Inc. is the second-largest online-only retailer in the United States. Founded in 2001, Newegg has more than 12 million registered users and regularly earns industry-leading customer service ratings. The award-winning website, www.newegg.com, offers customers a comprehensive selection of the latest high-tech products, detailed product descriptions and images, as well as how-to information and customer reviews. Using the site's online tech community, customers have the opportunity to interact with other computer, gaming and consumer electronics enthusiasts. Newegg.com Inc. is a wholly-owned subsidiary of Newegg Inc. and is headquartered in City of Industry, California. With more than 50,000 members, the National Federation of the Blind is the largest and most influential membership organization of blind people in the United States. The NFB improves blind people's lives through advocacy, education, research, technology, and programs encouraging independence and self-confidence. It is the leading force in the blindness field today and the voice of the nation's blind. In January 2004 the NFB opened the National Federation of the Blind Jernigan Institute, the first research and training center in the United States for the blind led by the blind. Please visit our Web site: www.nfb.org.